The Norfolk Island pine is a tropical tree that, in its smaller early stages of growth, makes a great houseplant suitable for decorating as a Christmas tree. Norfolk Island pine is native to only a very small piece of land on the entire planet, a tiny South Pacific island several hundred miles east of Australia called, appropriately enough, Norfolk Island. The island and the tree were discovered in the 1700’s by the great global explorer, Captain James Cook. In its native environment, the Norfolk Island pine becomes a towering specimen, sometimes reaching heights in excess of 200 feet. However, the tree we are most familiar with is the little one (about 1 to 3 feet in height) that shows up in garden centers and retail stores ‘round about Christmas time, often offered for sale with a bright red ribbon already wrapped around its container! The little Norfolk Island pine makes a great houseplant, providing year-round indoor greenery that is rather soft and velvety to the touch. The tree is undemanding for the most part, requiring plenty of bright indirect light and some full sun but not full direct bright sunlight all the time. 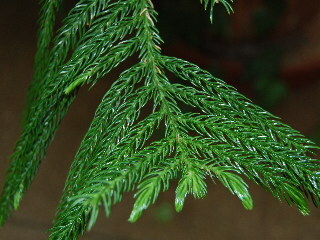 The less light your tree receives, the more the branches of the tree will assume their graceful drooping growth habit. Keep the soil in your tree's container evenly moist, not soggy but not allowing it to dry out completely, either. The tree thrives in normal household temperatures (about 62 to 72 degrees F.), and does best in a relatively humid environment (remember, its original home was a tropical South Pacific island). If winter heating in your house makes the air overly dry, the use of an air humidifier or moisturizer may be helpful. Also, the tree will always respond favorably to misting, regardless of your household humidity conditions. When it comes to controlling height growth in your Norfolk Island pine, the general rule is that the container is king; in other words, if you limit the size of the tree’s container and thus the space available for root development, you will also limit the height of your plant. By the same token, if you want a larger housepine (get it, houseplant that’s a tree?! 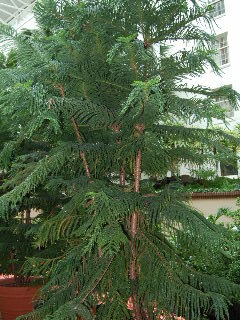 ), transplant your Norfolk Island pine to a larger container. Just remember to use good judgment in this; a ten-foot tree growing in your living room might be too much of a good thing! Some gardeners have been known to transplant their thriving Norfolk Island houseplants to the great outdoors, incorporating them directly into the home landscape. This can work, but we need to keep a few things in mind. Number one on the list of considerations is our knowledge of where this tree originally came from, and therefore what it needs, and what Nature intended it to be. Because of its origin in the warmth of the South Pacific, the tree needs year-round above freezing conditions in order to survive. This means that for the continental United States, only southern Florida or parts of southern California will support the outdoor growth of your Norfolk Island pine. And, if indeed your tree takes to its outdoor home, don’t forget that it will become quite tall, possibly reaching a height in excess of 100 feet right there in your cozy little home garden! At this point, you will need to be constantly on alert for the possible approach of any strong winds, hurricanes, tornadoes, or other natural forces that could break your tree or send it crashing through your rooftop. Planter, beware! Our advice, therefore, is to nurture your little Norfolk Island pine in an attractive container in a bright location in your home. Enjoy it throughout the year as an unusual houseplant, and dress it up in December as a unique living Christmas tree!